Swagbucks Review: Is It Legit Or Is It a Scam? If you’ve ever read a “How to Make Money on the Side” article, chances are you’ve heard of Swagbucks. Swagbucks is a popular survey site that will pay you for completing surveys and other tasks. There’s no doubt Swagbucks is popular. Since its inception in 2008, the company has paid out nearly 300 million dollars. In fact, their website says they give out 7,000 free gift cards every single day. But is it really as easy to make money on Swagbucks as the company claims it is? And how do you make money on Swagbucks in the first place? We’re here to give you the good, the bad and the ugly on one of the most popular money-making sites to-date. By the time you’re done, you’ll know exactly what to expect from Swagbucks. And we hope you’ll have a better idea of whether or not it’s right for you. Description: Swagbucks is a survey site that pays people for sharing their opinion when they shop, answer surveys, watch shows, discover new products, search the internet, play games, and test out mobile sites. When you perform tasks, you are rewarded with "Swagbucks", which can be exchanged for gift cards (Amazon, Walmart, etc.) OR cash via PayPal gift card. Swagbucks was founded in 2008 by a company called Prodege. Prodege was founded in 2005 and has a Better Business Bureau rating of A and a Trust Pilot rating of 8.4 out of 10. Prodege as a separate business operates to help brands boost engagement with customers. 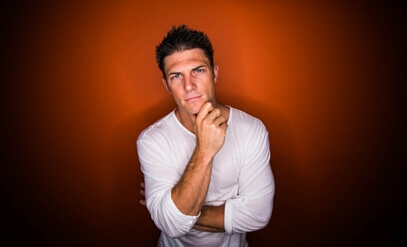 They founded Swagbucks in 2008 with the goal of rewarding users for online activity. When you complete certain activities on the site, you are able to earn rewards. You can read more about the specifics of earning in the next section. Swagbucks will give you rewards points for completing a number of various activities on the site. Here is some information regarding the various ways you can earn points using Swagbucks. If you ask friends, family members and acquaintances to sign up for Swagbucks, and they do, you’ll get paid. For each signed up and active referral, you’ll get 300 points. For the record, a “point” on Swagbucks is worth 1 cent. So, 300 points, for example, equals $3. Now, the $3 sign-up bonus only applies if the person you sign up earns 300 points before the first of the following month. So, if you refer your best friend to Swagbucks and she signs up on the 15th of the month, she’s got to earn 300 Swagbucks (SB) points within 15 days if you want to get your bonus. Additionally, you’ll get paid ten percent on all SB points that any referral you make earns. So if your BFF earns 1,000 SB points next month, you’ll earn 100 SB points because you referred her. 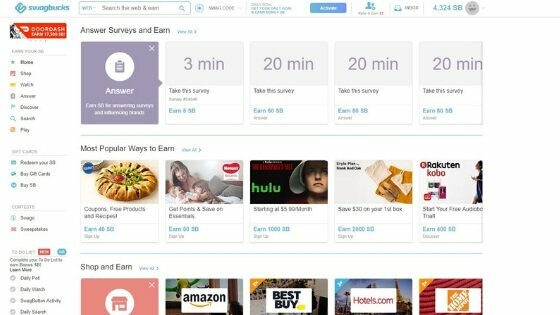 One of the main ways Swagbucks pays members is by having them participate in surveys. 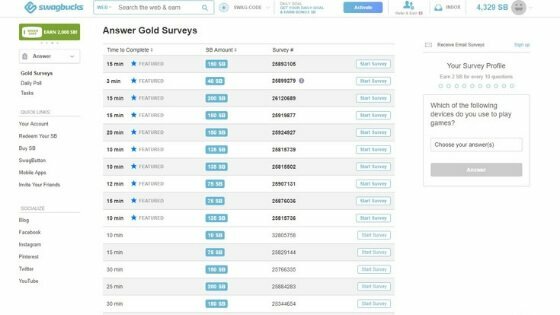 The surveys you find on the site can take anywhere from a minute to several minutes. The surveys seem to pay relatively handsomely compared to other activities on the site. One of the things I like about Swagbucks’ survey section is that they tell you up front how long you should expect the survey to take. They also tell you how many SB points you’ll earn for taking each survey. Note that regarding the surveys you do need to qualify to get full pay. Most surveys are searching for opinions from certain demographic groups. So, you might get part way through a survey and find out you don’t qualify or fit their demographic. You can also play other games on Swagbucks and earn SBs, but those games are accessed through the GSN (Game Show Network). Note that you might have to purchase online coins to play some of those games. Read the fine print carefully. Yes, they will pay you SBs for watching videos. When you browse through the videos, you’ll get thumbnails showing you how long they are and what they pay. The videos usually consist of a series of short videos, but they’ll let you know the total watch time before you start. If you like watching videos anyway, this could be a good alternative to YouTube and other channels. At least with Swagbucks you earn some money. On the homepage you’ll find thumbnails for shopping deals as well. They might offer to pay you $5 for purchasing a $50 item, for instance. This option for earning, however, can be risky. If you’re continually buying stuff you don’t need you could put a big hole in your pocket. Don’t be tempted to spend on something you really don’t need or want just so you can earn some SBs. Swagbucks will also pay you points for trying new products or services. For instance, you might get 100 SBs for trying a service like Personal Capital for 30 days. Or, you might earn SBs for trying a product they send to your home. Note that many of these services and products may cost you money if you don’t cancel within the specified time period. Read the fine print and keep track of the products and services you try. Cancel within the trial period if you’re not interested in continuing with the product or service. 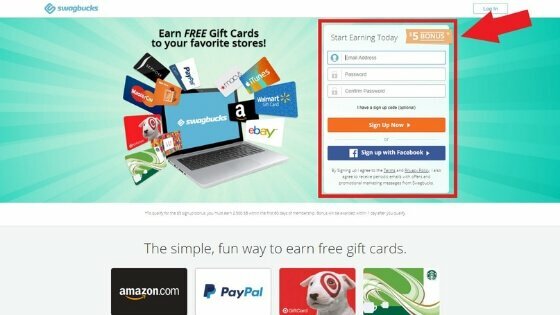 Swagbucks will also reward you with points when you search the Web. Note that you have install the Swagbucks search bar to earn while searching. Note that not all searches will pay you points. If you’re on the Web a lot and do a lot of research, this could be a good way to earn. If you’re just searching for the purpose of earning points, you can probably find better ways to earn. So, what happens after you earn your points doing one or more of the above activities? How do you get your cash? What else can you get besides cash? We’ll talk about that next. How Do I Get Paid from Swagbucks? And more. If you make the gift card choice, there’s pretty much an option for everyone. Choosing to enter sweepstakes (they’re called “Swagstakes” on the site) can be profitable too. You could win a variety of prizes including more SBs, gift cards and other items such as electronic items. And lastly, you can choose to have the monetary value of your SBs given to your favorite charity. All good options for the points you earn. If you live in one of the above-mentioned countries and are at least 13 years old, you’re eligible to join. Note that if you’re considered a minor you may have to have parental permission to join. It’s totally free to join Swagbucks. And it’s free to earn points in most cases as well. Note that where you’re required to spend money to earn (i.e. the shopping activities) you will have to spend money in the form of buying something. Is it Worth it to Join Swagbucks? Well, that’s the gist of the program. So, what do you think? Is it worth joining? We won’t make that decision for you, but we will summarize the pros and cons of the site. One of the things I like about Swagbucks is that it’s an organized site that makes it easy to find ways to earn. For instance, on the left sidebar of the home page, you’ll find your “to do” list. The “to do” list lets you know of easy ways to earn points. Also on the homepage, you’ll find dozens of activities, along with the points you can earn by completing them. The site does make it easy to find ways to earn. Because it’s so easy to earn, you can easily work the site in your spare time. You can earn SBs while you’re watching TV, waiting for an appointment or just have a half hour with nothing to do. And, the rewards are good. Who doesn’t like PayPal money? The gift card selection is pleasing as well. I also like that you can start earning Swagbucks as young as 13. This could be a great way for teens to get some extra cash. That being said, there are some downsides to the site, in my humble opinion. The fact of the matter is that you just don’t get paid very much for the activities you complete on the site. With one exception: the rewards can be handsome IF you’re buying something. That, at least in my mind, kind of defeats the purpose. When I’m searching for online income, I want to MAKE money, not spend money. So yeah, I may have earned $3 on that $30 item I purchased, but I had to spend $27 to get it! Unless you’re committed to being disciplined about not buying things you don’t need, it can be tempting to take advantage of the shopping deals they have on Swagbucks. At the end of the day, the hourly wage you get paid for completing activities on Swagbucks may not be worth it for you. Earning money with Swagbucks cannot be your full-time job -it’s much better to utilize Swagbucks for extra spending money throughout the month versus making rent. Some people find that although they try to make money with the surveys, they can’t. They’ll get part way through the surveys only to find out they don’t qualify. You do get paid a little bit just for trying, but again, the hourly wage when you calculate it is very low. Now, if you’re on the internet just to browse, play and to have fun, that’s a different story. After all, why not make some money while you’re doing so, right? But if your goal is to earn some side hustle cash, you’re better off staying with some other options. Which ones, you might ask? I’m glad you asked. Because now I’m going to share some side hustle ideas that can actually make you some real cash. If You Really Want Some Great Side Hustle Ideas……..
Luckily, there are plenty of side hustle ideas that can make you some usable cash. You can make $10, $20, $30 an hour or more with the right side hustle. You just need to know what you want to do and how to get started. And that’s where we come in. Here are some valid money-earning side hustle ideas for you. Believe it or not, there are dozens of ways you can make some serious extra cash without leaving your home. Here are a few legit work from home jobs that might be right for you. There are many companies that hire people to work from home. One popular job people do from home is that of a customer service representative. Companies such as U-Haul and others hire people to answer customer phone calls, and you can do this remotely. If you have a newer personal computer and a headset, you’re well on your way to qualify. When you work for these companies, they simply connect you to their servers and you have everything you need to help customers who call in. One nice thing about customer service rep jobs that allow you to work from home is that they are often flexible about the hours you work. Many companies have early morning, late night and overnight shifts. This means that you can work the jobs around your main job or around family responsibilities. Do you have great customer service skills and like working with people? If so, this could be a good side hustle for you. Another popular job that people work from home is that of a data entry specialist. Data entry specialists enter information into databases for companies. If you can type fast and have good accuracy when you type, this could be a good side hustle choice. As with customer service rep jobs, a lot of data entry companies will let you choose your own hours. Do you like working to help people of all ages learn? If so, you might enjoy tutoring people from home. Online tutors teach kids and adults alike in various subjects. You might work for a company such as Chegg that teaches high school and college students in various subjects. If you tutor for Chegg you can teach whatever school subjects you’re comfortable with. Math, English, Science and more; the choice is yours. Or, if you work for VIP KID you can teach Chinese students to speak English. Note that you don’t have to speak Chinese to tutor Chinese students in the English language. While it is helpful to know Chinese, most Chinese-to-English tutoring centers don’t require it. Instead, they have online immersion-type programs in place that anyone can use. Some companies require tutors to have a teaching degree or other college degree too. And still others don’t require a degree. Check each individual tutoring site for more information on tutoring requirements. You also may be able to find work from home as an employee of a local company near you. Many local companies these days hire remote workers, meaning they do their job from home. If the job you’re applying for doesn’t require you to be in the office, consider asking about working remotely. For instance, if the job requires a lot of computer work or phone work. Those types of jobs could be available to work from your home office. However, working for others from home isn’t your only option. Don’t want to work for others from home? How about working for yourself from home? Consider these options for starting your own business as an independent contractor. I’m here to tell you, friends, that it IS possible. And if you’re good at writing you can get paid pretty well. Freelance writers generally make between $15 and $50 an hour – and higher – for writing gigs. I know some writers that make $100 an hour or more by writing from home. Depending on what you want to write, your pay may be different. You could find work writing articles for blogs and news sites. Or, you might get work writing Standard Operations Manuals for companies. There really is a wide variety of writing jobs out there for freelancers. If you think freelance writing sounds like the gig for you, we have more information on how to become a paid freelance writer here. There are other ideas too. Just do an Internet search for “graphic design jobs from home” and see what pops up. Another popular independent contractor position is that of virtual assistant. A virtual assistant can do many different online tasks when they work as an independent contractor. As a virtual assistant you might help someone run a blog or website. Or, you might help an online business owner assist customers or organize tasks. A virtual assistant is similar to an administrative assistant in many ways. The one big difference is that you’ll work from home instead of working at an actual office. If you like assisting others with various tasks, and you’re good at being organized, this could be the job for you. I’d recommend finding freelance writing and other jobs by searching websites such as Upwork. You can also reach out directly to blog or news site owners and ask if they’re looking to hire. Companies like hiring independent contractors because they don’t have to give them steady work or pay benefits. Instead, they can farm out jobs as they need them done, and to the contractors they like best. Our primary virtual assistant for Money Peach is Kayla and she came on the podcast to share how she now earns $10k every month as a virtual assistant (VA). Another great side hustle option is to start a business you can work locally. There are several side hustle jobs you can do right in your own neighborhood or town. You’ll still work for yourself and get to set your own hours and choose your own clients. However, you’ll be interacting with people in person instead of online. Here are some ideas. If you like being with and taking care of children, you could start a babysitting or nanny service. Advertise your services to neighbors and loved ones who have small children. Be a “go the extra mile” provider by ensuring the house is clean when parents get home and by being interactive with the kids in a fun way. Play games, do coloring sheets, etc. Kids who like their babysitter or nanny are sure to ask parents if they’ll use the same sitter again. If you like and are good at mowing lawns, you could advertise your services to take on this tedious chore. Bonus: if you have some basic landscaping skills you can earn even more. Raking leaves, shoveling snow and trimming shrubs are all additional services you could offer. Mowing and landscaping are some of the jobs the busy people of today just don’t have time to do themselves. If you’ve got some basic lawn care equipment, start advertising your lawn care business. Do a good job, charge a fair price and watch your business grow. Another great side hustle business is that of cleaning and organization. There are many ways to make money by doing so. For instance, you could offer home cleaning services. You could come to a house once a week and dust, vacuum and clean things up. Or, you could do larger cleaning jobs like window cleaning or deck cleaning. How about starting a mobile car washing service? You show up to scheduled homes to clean the inside and outside of a client’s car. All you would need would be a portable vacuum cleaner, trash bags, soap, rags and a bucket. You’d use the client’s water and water hose for simplicity’s sake. Go the extra mile and clean the interior of the car really well, including the windows. You could charge a decent hourly wage for a thorough cleaning and detailing of neighborhood cars. This is another job that people love to have done but don’t have the time to do. Another option would be to offer organization services. If you’re good at organization, this could be a good side hustle for you. Advertise your services to organize homes, garages, basements, etc. People love being organized but often don’t have the time to get organized on their own. Want another idea? How about helping people with small scale party planning? You could help people plan small weddings, birthday parties or holiday gatherings. If you’re good at planning a party, this might be the perfect side hustle for you. To sum it up, earning Swagbucks can be a great way to earn a little extra cash, however you’re not going to make a living doing so. If you’re looking to make some real money, you’re better off considering other options like the ones mentioned above. All said and done, there are many ways to earn side hustle money if you look around. What about you: have you ever tried Swagbucks? If so, what did you think? Or, have you tried other ways to earn some side hustle cash? Let us know in the comments section. https://www.moneypeach.com/wp-content/uploads/2018/07/Blank-Photos-Test-560x315-3.jpg 315 560 Sara James https://www.moneypeach.com/wp-content/uploads/2016/06/moneypeachLOGOhomepage.png Sara James2018-07-26 00:20:032018-11-12 14:25:49Swagbucks Review: Is It Legit Or Is It a Scam? Great article on Swagbucks. As per my research, Swagbucks is the most trusted and legit survey site out there, and it also offers multiple earning options in the form of surveys, watching videos, polls, playing games, searching on the web, and referral commission. If you work on other popular survey sites like Opinion Outpost, Inbox Dollars, Global Test Market, and Prize Rebel you can expect to earn between $20 to $25 per month. On the other side, I have seen people can easily earn between $25 to $50 per month with Swagbucks. It has also paid over $260 million to its members. Glad to hear you found the article helpful!